I want your opinions in another little poll about our kitchen. I ordered the countertops and sink last week (I LOVE them and will post details at some point) but have had a big dilemma about how many holes to have drilled in them for the faucet. I hadn't chosen a faucet yet...woops! So I have a couple more days to change what I told them if I find a faucet that needs something other than 3 holes drilled. Now here are the choices I have sourced so far. I like them both...just not sure if we went with the second one if people would think it looks weird. Let me know your honest opinion on the poll at the right and in comments. They both have a pull-down sprayer that is built in...so if you have a pull-down sprayer and like it or don't - let me know why. Oh, and one last thing. 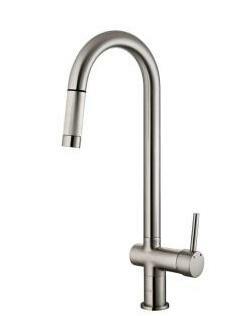 I'd also love to know what finish you like on a kitchen faucet. I don't have a poll for that so feel free to leave a comment. Do you like brushed nickel, stainless, chrome, or something else?? The first looks too much like a minibar faucet with a very tiny handle. And I’m just not sure the arm of the faucet or the arms of the small children who will use the faucet will have enough reach to make it functional. For that reason, I’m out. The second would be a nightmare to keep clean. With faucets you have to constantly wipe them down to keep then shiny. Here the wire would get full of spaghetti sauce and crud be tough to keep looking good. I like the idea, but it’s not for me. I’m out. I like you, and I like the trendiness of your faucets. But I’m not sure mainstream America will get it. For that reason, I’m out. In the end it’s about money. It always is. Pick something that you can afford. Ha ha! Just to be clear...the above comment is from my witty husband! Yeah, I'd choose option 1, although I think both are not very mainstream - so if you plan on ever selling the house down the road, it might not appeal to others. But option 2 would definitely be a nightmare to keep clean - and the only place I've ever seen a style like that is mounted above the stove as a pot-filler. My favorite finish is oil-rubbed bronze. Definitely in style these days! Option 1 is the best for your kitchen. If you plan to hire a professional dishwasher, then go with Option 2. Brushed nickel should be the default, or look for something that otherwise matches your kitchen hardware. I really look forward to watching a movie in your basement someday. I like 1, don't really care for 2. Brushed nickel doesn't show water spots and smudges. One more thing... I saw a home remodel where they put a foot pedal on the floor, under the counter so that when your hands are nasty, you just push the pedal and the water turns on. I loved it! It was only a $250 add. 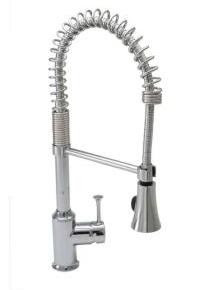 I know there are kitchen faucets now that you can wave your hands in front of, like in public restrooms, but I loved that pedal. It was a little retro and very functional.